"TV. If kids are entertained by two letters, imagine the fun they'll have with twenty-six. Open your child's imagination. Open a book." 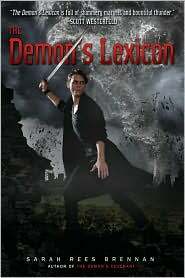 The Demon's Lexicon is the first book of an urban fantasy trilogy that's set in England and follows brothers Nick and Alan Ryves, siblings Jamie and Mae, and Sin. Magicians exist in the world of The Demon's Lexicon Trilogy, they blend in with regular humans and most people don't know of their existence. Magicians have a small amount of power, but they crave more. Magicians call up demons (beings of air from another world) and give them humans to possess in exchange for greater magical powers. Standing against the magicians is the Goblin Market, a loosely allied group of people who work to protect humans from magicians and demons, for a price. Nick, Alan, and their mother Olivia are on the run from magicians, they have been for as long as Nick can remember. Olivia used to be a member of the powerful Obsidian Circle, a group of magicians led by Black Arthur. They drove her mad and she ran away, but Olivia stole something first, and since then all the magician circles have been hunting Nick and his family. The Demon's Lexicon begins with a magician's attack on the Reeves family; during the clean-up Nick and Alan encounter Jamie and Mea, classmates of Nick, who've heard the Ryve's were the people to go to if you had a problem with demons. We quickly learn that Jamie has been having nightly visits from a demon, and if you let them in they mark you. One mark to form a doorway and the demons can follow you always, the second mark to allow demons to enter your dreams and means someone has to die, the third mark is the demon's eye and means you'll be possessed. Jamie has been marked three times and his death seems certain, until Alan is marked by the same demon. What follows is an adventure across England with visits to a Goblin Market and a dance to call up demons. Along the way family secrets are revealed. Nick, Alan, Jamie, and Mea learn the importance of truth and lies, that magicians really can be anyone, and any human can house a demon under the right circumstances. Nick is the narrator of the first book. He's an incredibly focused character who only cares about himself and Alan, and the content of the book reflects this. The story takes a very narrow view with other characters and information only being mentioned when they directly affect Nick and Alan. This also means that the other characters are portrayed only through what Nick observes them do, he doesn't spend much time thinking about their emotions or motivations. This changes in The Demon's Covenant where Mea's the narrator. She's posssibly the most empathetic of the characters and focuses a lot of their emotions and motivations, though no one's all knowing. Both books focus a great deal on secrets and last minute reveals so the narrators are seem carefully chosen as the people with some of the least information, or who are incapable or uninterested in finding out the secrets until they come to a head. The Content and Reading Level of this trilogy is young adult. It deals with romance, making out without much romance, sexual orientation and homophobia, racism, death of friends and family members, and several of the protagonists have to commit murder at different points (some deal with more PTSD like reactions to this than others). While most 12 year olds can handle the reading level of this series not all of them will have the maturity to understand or appreciate the content. While The Demon's Lexicon passes the Bechdel Test, even through the female conversations are of the blink and you'll miss them sort, The Demon's Covenant blows it away. 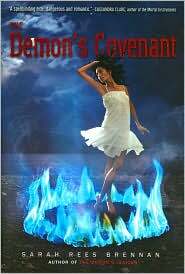 This book further developes the previous minor characters of demon dancer Sin, and Goblin Market leader Merris Cromwell. It also introduces the reader to Mae's workaholic mother Annabel, and several important female magicians. This isn't too surprising as Sarah Rees Brennan is an ardent feminist and has written numerous posts about female characters in her blog. (See here, here, and here , and yes here too) The last book in the trilogy casts Sin as the narrator so I imagine it too will have awesome representation of the ladies. Rees Brennan manages a wonderful blend of heartbreak and humor. Most of the main characters are sarcastic and call upon a gallows sense of humor to get them through dangerous situations. Jamie is certainly the standout character though, his response to terror is the make hilarious comments that range from pithy to rambling. In response to danger Nick grabs his sword, Alan makes plans, Sin does some combination of the two, Mea raises her chin bravely, and Jamie spends a couple minutes cowering and making quips before stepping up and doing what's necessary. In my opinion this makes him the most relatable character. 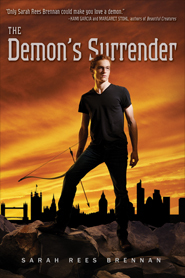 The last book in the trilogy, The Demon's Surrender comes out this spring. I can't wait for it's release. This is one of the few books I have no problem paying hard cover prices for, even on my small child care provider's salary.